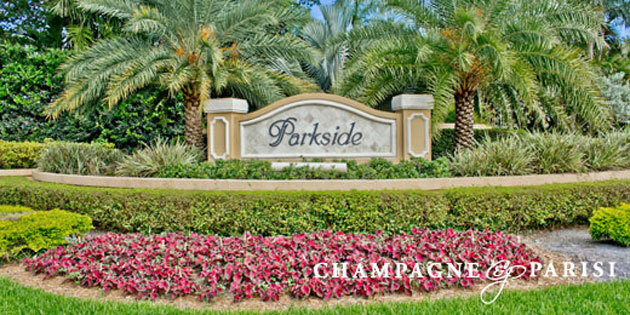 Parkside is a luxury gated community situated in the heart of Boca Raton between 18th street and Camino Real, on the east side of Military Trail. For your safety concerns, the main entrance boasts an elaborate 24 hour manned guard gate, and the second entrance is gated as well. Landscape-wise, Parkside is encompassed with the typical South Florida foilage, with tree-lined streets, colorful tropical plantings, and beautiful natural lakes. Additionally, residents in Parkside enjoy access to the community's clubhouse, which offers rooms that are great for hosting an event or party, as well as tennis courts that homeowners can take advantage of year round. Evidently, Parkside is a wonderful family-friendly community surrounded by the area's natural parks, serene lakes, and world-class amenities, making it a perfect place to call home.